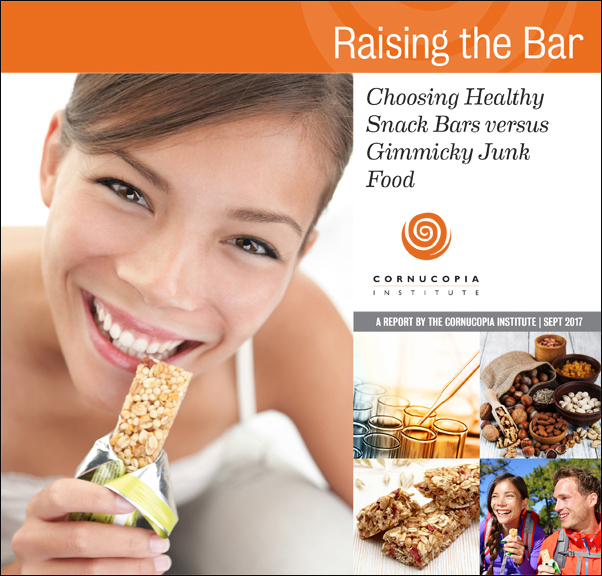 The Cornucopia Institute’s report: Raising the Bar, Choosing Healthy Snack Bars versus Gimmicky Junk Food, exposes misleading marketing practices by food industry giants that market candy-like snack and energy bars as wholesome and nutritious. The report further exposes leading natural/organic brands for including cheap, conventional ingredients instead of creating nutritive products that qualify for the USDA organic label. An accompanying scorecard demonstrates how snack bar quality varies widely among brands, even among the many brands that market themselves as “made with” organic ingredients (a label with lower standards than certified organic). For example, the USDA National Organic Program has specific regulations that provide industry-friendly loopholes for the use of conventional, hexane-extracted ingredients in the “made with” organic category (a process explicitly prohibited in products qualifying to display the USDA organic logo). The Raising the Bar report explains how the highly profitable snack bars industry is rife with gimmicky substitutes, such as protein isolates, sweetener syrups, and flours, instead of whole food ingredients. The report also explains how, in many other ways, consumers get a safer and higher quality product with USDA certified organic brands over conventional, mass-market brands that contain long ingredient lists including questionable gums and synthetic preservatives, colors, or flavors. With the exception of certified organic bars, many products add ingredients processed with the neurotoxin solvent hexane, such as conventional soy protein isolate, soy protein concentrate, soy lecithin, and tocopherols. Low levels of hexane have been detected in common snack bar ingredients, including protein isolates, which are extracted with the neurotoxic chemical. Since protein has hot marketing cachet, protein isolates are highly modified ingredients used to artificially inflate the protein content of snack bars, but they leave out the beneficial oils, fiber, and vitamins found in more expensive, whole food ingredient options such as nuts and seeds. The highest rated bars on The Cornucopia Institute’s scorecard are USDA certified organic and use only organic fruits, nuts, and seeds without any added sugars, gums, flours, protein isolates, or preservatives. Published research has consistently illustrated that organically produced products have a demonstrably lower level of agrichemical residues. There is also documentation that illustrates their nutritional superiority (likely derived from careful soil stewardship). The scorecard “outs” some brands offering both highly rated and low-rated products, such as Clif Bar and Lara Bar (the latter produced by General Mills). This makes it difficult for consumers to choose products based on brand alone because quality varies widely between products within the same prominent brands.